Every great city has its iconic Avenue, rich in history and heritage. New York has Park Avenue. Paris has Avenue Champs-Élysées, and Toronto has University Avenue. The developer for this project is Amexon development Corporation, architecture by Core Architects, and interior design by II BY IV Design Associates. 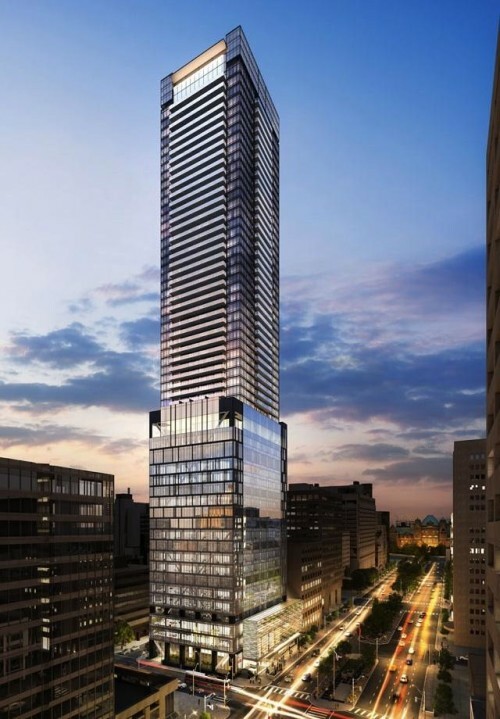 The Residences or 488 University will be a 55 storey (453 suites) tower of glass and steel ascending from a glass-jewelled podium to a simmering crown. Suites will range in size from 544 sq ft (1 bedroom) to 1620 sq ft (3 bedroom). The SkyClub will be two full floors of light filled space, opening into the sun and swim terrace.The spacious fitness centre will be outfitted with state of the art strength and cardio training equipment. SkyClub will be a place to indulge in a light meal and a drink at the SkyBar. Design elements will incorporate Art Deco-inspired aesthetics in rich tones and textures creating an expansive feel to each suite. It will also have classic modernism and luxurious finishes that celebrate refinement and indulgence. Every aspect of the residences will offer the very best – luxuriant finishes, soaring spaces, floor-to-ceiling windows, meticulous attention to detail – a thrilling design made possible by the visionary and creative eyes of II by IV Design. VIP Agent sales will be begin very soon, so contact me today to get to the front of the line.